Yoshiro Nakamatsu (see the nearby photo), born 26 June, 1928, is a eccentric Japanese inventor (known also as Dr. NakaMats), claiming to hold the world record for number of inventions with over 3200, including the floppy disk, the CD, the karaoke machine, the digital watch, CinemaScope, armchair "Cerebrex", sauce pump, the taxicab meter, etc. Dr. NakaMats was voted by the US Science Academic Society as one of five greatest scientists in history, in the company of Archimedes, Michael Faraday, Marie Curie, and Nikola Tesla—and he plans to live until 144! Nakamatsu's claims concerning the floppy disk technology must be considered as reasonable, because he licensed about a dozen of his patents related to this technology to IBM Corporation in 1970s. 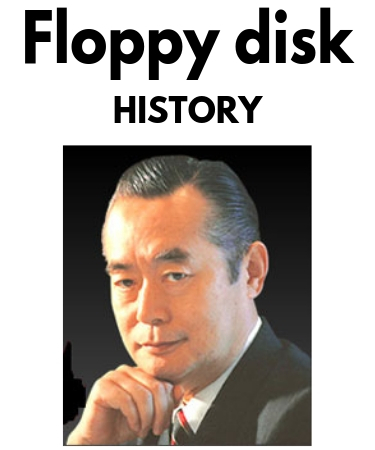 Nakamatsu also claims, that he invented floppy disk technology as early as in 1950, when he was a student at the University of Tokyo, but after six of Japan’s leading corporations turned down his request to have them produce the floppy disk, he granted the sales license for the disk to IBM. In 1960s, the engineers at IBM who had developed RAMAC and the early disk drives understood the significance of a small, removable disk memory. In 1967, IBM gave their San Jose, California storage development center a task to develop a simple and inexpensive system for loading microcode into their System/370 mainframes in a process called Initial Control Program Load (ICPL). Normally this task would be done with tape drives which almost all 370 systems included, but tapes were large and slow. IBM wanted something faster and lighter that could also be sent out to customers with software updates for $5. IBM Direct Access Storage Product Manager Alan Shugart assigned the job to David L. Noble. During 1968 Noble experimented with tape cartridges, RCA 45-rpm records, dictating belts, a magnetic disk with grooves developed by Telefunken, but finally created his own solution—the floppy disk (actually they called it the "memory disk"). IBM introduced the read-only and holding 80 kilobytes diskette commercially in 1971, under the name Minnow, and shipped it as the 23FD, a standard part of System 370 processing units and for other products. It was a plastic disk 8 inches in diameter, 1.5 mm thick, coated on one side with iron oxide, attached to a foam pad and designed to rotate on a turntable driven by an idler wheel. In 1970 IBM applied for a patent and U.S. patent Nr. 3678481 was granted in 1973. A read-only magnetic head was moved over the disk by solenoids and read data from tracks prerecorded on the disk at a density of 1100 bits per inch. The disk was "hard-sectored" with 8 holes around the center to mark the beginning of data sectors. At first, its capacity was only 81.6 KB, but by Feb. 1969 he had doubled the thickness of the plastic base to 3 mm and coated both sides to add more capacity. In June 1969, the Minnow was added to the IBM System 370 and soon began to be used by other divisions in IBM. In 1970, the name was changed to Igar and Noble had a staff of 25 engineers to help him make improvements. 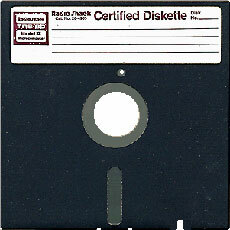 By 1971, Igar became the 33FD disk drive and the 8-inch floppy disk became the Type 1 diskette. The speed was 360 rpm, with head access time of 50 milliseconds. The 8 hard sector holes were replaced by a single index hole for "soft sectors" or "IBM sectoring" across 77 tracks. 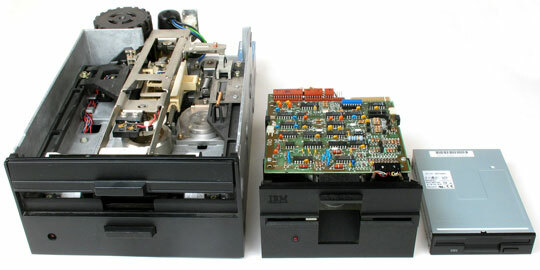 In 1976 the 43FD disk drive was sold with dual heads to read and write to both sides of the diskette. A new model 53FD was added in 1976 that used modified frequency modulation to record double-density on both sides, resulting in a capacity of 1200 KB. Alan Shugart left IBM and moved to Memorex where his team in 1972 shipped Memorex 650, the first read-write floppy disk drive. The 650 had a data capacity of 175 kB. Later Shugart established a new company, and in 1975, Shugart Associates produced an 8-inch floppy disk to hold 800k that offered for the first time a low-cost drive for the emerging personal computer market. In 1976, Jim Adkisson and Don Massaro, Shugart engineers, sat down for lunch with a customer (An Wang of Wang Laboratories), who complained that the 8-inch drive was too big for the personal computer. When Adkisson asked what the size should be, An pointed to a napkin on the table and said, "About that size." 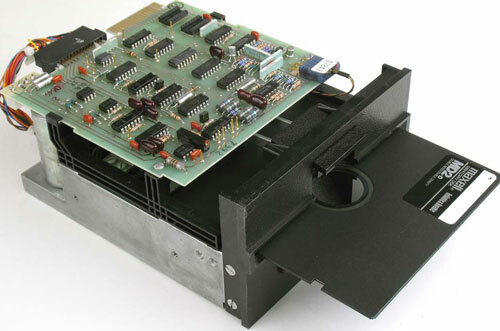 Adkisson returned to the Shugart lab with the napkin and designed the 5.25-inch floppy drive (see the nearby photo), introduced in december 1976 as the model SA-400 (see the lower photo) with a capacity of 110 KB (single-side single-density) and price $390. The model became one of Shugart's best sellers, with shipments the rose to 4000 drives per day. The company turned to Matsushita in Japan to help make the drives, starting that company on its rise to becoming the largest floppy drive manufacturer in the world. Sony developed a 3.5-inch floppy drive (see the nearby photo) by 1980 and began a two-year effort to make it the U.S. floppy disk standard. They stored 438Kb of data, and later 720K (double-density) and 1.44MB (high-density). Sony declared that its new drive was smaller, faster, better protected (it had hard-shell cartridge and an automatic shutter, that closed over the recording surface, when it was removed from the drive), and could fit in a shirt pocket. Initially there different incompatible disk sizes (3-inch of Hitachi, 3.8-inch of Canon, 4-inch of IBM, etc. ), but Sony's soon became dominant. 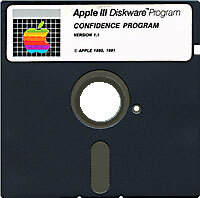 Sales of the 3.5-inch floppy began to surpass the 5.25-inch version by 1989, and Japanese companies would drive most U.S. disk producers out of the market. 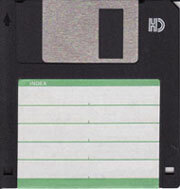 For many years 3.5-inch floppy disks were as plentiful as plastic bottles and were the most common PC storage disk. Now for the most part, recordable CDs and DVDs, and flash drives have replaced floppies as the means of transporting files from one computer to another computer.